"I'll get the better of him. He can't take any more. He's a very weak person anyway, who tires quickly like a child." Film collector and promoter Raymond Rohauer has something of a mixed reputation due to some allegedly questionable dealings over the years. But what is undeniable is that he is an important figure in the preservation of early film history, having taken the lead in preserving most of Buster Keaton's silent output. 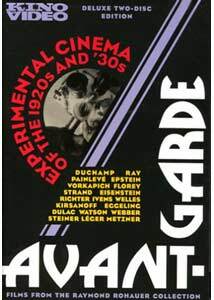 He was also, as this set amply illustrates, in the forefront of appreciating the early experimental cinema and Surrealism, and similarly protected many of those works. This two-disc set collects from Rohauer's archives over two dozen films of varying lengths that illustrate a wide variety of techniques and schools, making for an eclectic and intriguing set. Disc 1 opens with four films by Man Ray. Two of these are primarily experiments in technique, including his "Rayographs," with objects placed directly on the film emulsion. These are interesting primarily for their historical importance rather than any inherent qualities. L'Etoile de mar (1928) is a novel love story, with distorting glass and prisms used to give a dreamlike flavor of Surrealism. There are also plenty of examples of obsession and satires of Degas and other Impressionists. A definite oddity is Ray's Les Mystères des chateau de Dé (1928), a commissioned film that features faceless and anonymous figures, throwing dice and treating life (and wealth) as an elaborate game of chance. Since it's really a vanity project for the inhabitants of the chateau, it has some amateurish aspects, including such naïve techniques as running the film backwards and presenting it in negative. More entertaining is The Life and Death of 9413 A Hollywood Extra, a visually stunning satire by Robert Florey and renowned cinematic innovator Slavko Vorkapich. Like a Metropolis on the cheap, they evoke a sense of monstrous Deco cities with nothing more than cardboard cutouts. A darkly comic look at Hollywood, it's one of the highlights on the set. Dimitri Kirsanoff, a Russian practitioner of montage, presents two films. One is the fairly substantial Ménilmontant (1926), which tells the woeful story of two sisters whose parents are brutally murdered. Told entirely in visuals, it relies on montage and especially dissolves to relate its story. Despite being primarily a technical exercise, it's quite moving. The much shorter Brumes d'Automne (1928) evokes a mood and a sensitive recollection of a doomed relationship through juxtaposition. Technique is also vital to the storytelling in James Sibley Watson and Melville Webber's Lot in Sodom (1933). Using the newly developed optical printer, they convey both the sensuality of movement of the Sodomites and their threatening character as they demand to know Lot's guest (Lewis Whitbeck). The film shares many of the mystico-religious concerns as Cocteau's The Blood of a Poet, with which it was frequently shown in tandem. Hans Richter contributes two films with animation at the forefront. Rhythmus 21 (1921) is credited as the first abstract animated film, composed entirely of geometric shapes growing and shrinking. A clearer Dadaist wit is evident in Vormittagspuk (Ghosts Before Breakfast, 1928), in which everyday objects rebel and take on lives of their own. The influence of madcap animator Charley Bowers is probably present here, and indeed his work would really not be out of place in this collection. The sound version of the film was destroyed by the Nazis, but it's notable for film appearances of the composers Paul Hindemith and Darius Milhaud. One can hardly delve into Dada without involving Marcel Duchamp, and he's represented here by Anémic Cinéma (1926), shot by Man Ray, which is primarily concerned with wordplay and spiral imagery. Viking Eggeling (described in the notes as "the only Swedish Dadaist") goes on a journey of discovery and free association with his animated Symphonie Diagonale, composed of black and white drawings in fluid motion. Cubist painter Fernand Léger's influential Ballet Mécanique (1924) explores the rhythm of the mechanical world, and in best Cubist fashion relates it to human movement, primarily in the person of a stout woman endlessly climbing the same set of stairs. Jean Painlevé uses the vampire bat to comment on the Nazis, to the tune of Duke Ellington, in his oddball and clever nature documentary, Le Vampire (1939). Orson Welles fans will be intrigued by his first film, the 8m The Hearts of Age (1934), in which he portrays a trickster Death determined to take an old woman (Virginia Nicholson, whom he would marry shortly thereafter) and her servant in blackface. Expressionism is used to portray Death as a leveler and unifier, regardless of race and class. It's not much more than a technically proficient home movie, but it's certainly an intriguing artifact. Disc 2 contains an additional ten films, starting off with Überfall (1928), which is rather straightforward and naturalistic. Its main avant-garde attraction is a nifty dream sequence near the end that provides plenty of distortion and twisting of reality. Jean Epstein contributes two films, the first of which, La Glace à trois faces (1927), examines a scoundrel (Rene Ferte) who is involved with three very different women: a socialite, an artist, and a working girl. His own sexuality is rather ambiguous, as he is alternately obsessed with each woman in turn and discards each callously. A swirling camera and disturbing jump cuts highlight a particularly nightmarish local festival. Epstein's other offering, La Tempestaire (1947), is the newest film on the set. This atmospheric little picture features a young woman who pleads with the Tempest Master to bring her sailor boyfriend back home again. Many of the remaining films are elegaic little pieces that set a mood with quiet visuals, such as Romance Sentimentale (1930), the first sound film of Sergei Eisenstein and Grigori Aleksandrov. Although it opens with undercranked and dizzying visuals it soon calms down to being a 'cinematographic poem.' Herman Weinberg's Autumn Fire (1931) is another mood piece, this time revolving around reunited lovers. Manhatta (1921) by Paul Strand was the obvious inspiration for Ruttman's Berlin: Symphony of a Great City and other similar rhythmic cityscapes. Strand's more economical version focuses on the labor and textures of the city; in particular plumes of smoke and steam provide much of the movement and life within the frame. Germaine Dulac's symbolist La Coquille et le clergyman (1927) was actually banned by the British film censors for being too cryptic, and I have to say I wasn't able to delve much more out of it than they were. The final three pictures are some of the best in the set. Regen (Rain) is a 1929 impressionist depiction of a rain storm in Amsterdam. It's quite lovely, and segues thematically into Ralph Steiner's H2O (1929), a flowing depiction of water in its various forms, a dazzling tour de force of light and texture. Finally, the witty Even—As You and I (1937) provides a clever satire of Surrealism, as a group of would-be filmmakers (the filmmakers themselves) struggle with ideas to win a filmmaking contest in Liberty magazine, ultimately deriving inspiration from Salvador Dali paintings. Their resulting film-within-a-film, The Afternoon of a Rubberband is a charming satire of Un chien andalou complete with their own twisted versions of the most notorious sequences in that Surrealist masterpiece. Such a picture makes a fun capper to a sprawling set. Image Transfer Review: The films are all in the original full-frame aspect ratio. They suffer from varying degrees of wear, with the expected scratching and speckling. Those films that Rohauer held in comparatively early generation source prints have a sparkling and detailed appearance. The transfers seem fine overall, considering the state of the material. Be aware that on some films, Rohauer substituted his own titles and claimed copyright on the resulting films and those distortions of the historic record are carried over here on a handful of pictures. Audio Transfer Review: Numerous composers provide new scores for the silent films, and these all have good sound quality with nice presence. Sue Harshe's scores in particular have an edgy avant-garde character to them that's quite appropriate. The other films have rather crackly optical soundtracks (that for Manhatta, grafted on at some point in the past, is the worst sounding), but they're adequate enough, considering the period and the low budget films that are under consideration. La Glace à trois faces includes an English voiceover from Jean-Pierre Aumont, translating the French intertitles. Extras Review: The sole extra is a set of production notes credited to Elliott Stein, but they primarily consist of quotes from the Museum of Modern Art and other authorities rather than new or independent analysis for the most part. The interface is quite awkward, with two button presses necessary to move to the next screen of notes. There is a "Play All" button for each disc, though that would be rather overwhelming to take in all this frequently difficult material in a single sitting. An exhaustive and exhausting look at experimental films of the silent and early sound era, the package has some good transfers albeit of worn materials. The production notes could be a bit more thorough, but it's a good package of some intriguing films.